Hungarian Adwer's first release on 238W back in 2015 was received to high acclaim – with big support from the likes of Nick Warren, Hernan Cattaneo, Guy J, Sasha, Cid Inc. and many more at the time. 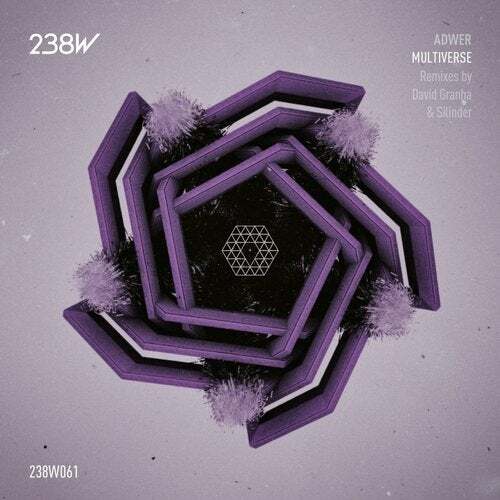 With his long awaited return to 238W, Adwer delivers a humdinger of a track fittingly titled "Multiverse". The track kicks things off nicely with its melancholic moodiness shining through as we meander effortlessly through tech inspired melodies, while the sultry chords sit wonderfully on top adding an extra layer of depth. Spanish supremo David Granha, famed for his intricate and refined tech productions is first up. His rework creates tension from the word go, as the atmospheric and driving vibe keeps you moving with warm tinkling sounds, a smooth edge and some nicely effected sounding pieces that keeps building to culminate into a true prime time club monster. We basically have the formula for a bit of a monumental outing. The sparseness is the key here, as this restrained gem works its magic while it plays away, creating a stunning glow, creating an air of sophistication. "Essential stuff!" Next up is Silinder, known for his polished and refined sound, who keeps the ethereal theme of the original alive, as the pulsating bass powers along, before its drum fills and general drive all combine to do the talking. Like something from yesteryear, yet sounding totally fresh - This mystical touch up takes the energy levels up a notch, but increases the melancholy with stripped back and lucid elements at the same time, before the luscious groove graces the rework changing the vibe and creating a blanket of warmth that wraps around the effected groove, confirming that Silinder really is a man at the top of his game. All the ingredients are there for another instant 238W classic. Don't miss out on this marvellous release. 'Multiverse' sees a worldwide release on March 21st, 2016!